HU SHAN AUTOPARTS INC.│HU SHAN AUTOPARTS INC.│Taiwan Auto Part. 1972 Zheng-Yi was founded in Banchiao, Taipei. 1982 Changed company name to "Hu Shan Transportation Co. Ltd" - HU SHAN means "Tiger Mountain" in Chinese. 2003 HU SHAN's 2nd generation, YC Chen, joined the company. 2005 Relocated to Ruifang due to business expansion. 2007 Established a tooling factory. 2010 Built a new warehouse (Up to 20,000 square meters). 2010 Established an injection department (10 injection machines). 2011 Passed the following audit with high scores: SGS Social Compliance and C-TPAT. 2011 Began offering US customers CHARTIS's "Products Liability Insurance". 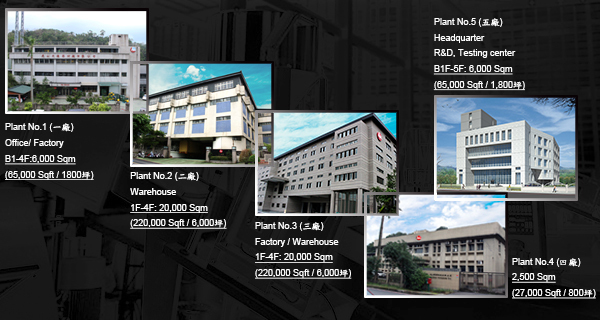 2012 Purchased the 3rd warehouse and factory (Up to 17,000 Square Meters) for future expansion. 2012 Changed company name to "HU SHAN Autoparts Inc". 2012 Upgraded to new ERP system - Data System WorkFlow. 2012 Began using Moldex3D CAE (Computer-Aided Engineering). 2013 Preparing for Initial Public Offering (IPO). 2013 Developing new CIS for company - New branding, trademark and Coloring...ect. 2013 Bulding new website - Customers can review all of our products online. 2014 Purchased a land for HU headquarter. 2017 New headquarter & RD center will be ready. Factory Size : 5,000-10,000 square meters . competitiveness, economic and social benefits, which can be sustained and steady customer expectations and satisfaction with the qualifying product. requirements for products intended to enhance customer satisfaction.